Community cleanups are one of the latest social media crazes, as the #Trashtag challenge takes the internet by storm. Individuals and communities around the world are banding together to clean up the environments where they reside. As the snow melts away to reveal the garbage buried beneath, there's no better time than now to spring-clean our own neighbourhoods. 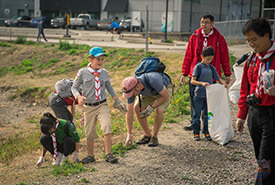 Community cleanups have always been a part of Scouting, and since 2002 Scouts across Canada have worked with their communities and the Great Canadian Shoreline Cleanup (GCSC) to remove over 5,300 kilograms of trash from shorelines. According to GCSC, the majority of litter collected last year was tiny plastics and foam. This demonstrates how easily litter can accumulate, whether intentionally or accidentally, such as when it’s blown from overflowing waste bins. Projects can vary depending on where you live. It is wise to research what needs to be done in your community and the areas of greatest priority, like specific neighbourhoods, streets, parks or shorelines. 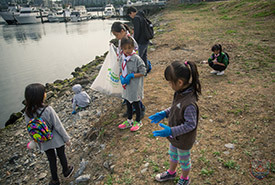 A community cleanup doesn’t need to just be collecting litter. Supporting your community can include projects ranging from greenspace cleanups, to revitalizing areas by planting flowers to repainting communal structures like playgrounds. A great place to start when choosing a project is to check in with your local town hall or committee. The project plan should include all of the basics: date, time, location, required equipment and local licencing or regulations. Also, consider having a Plan B if the weather isn’t right for the activity. The key to running a successful cleanup event is to have a large — or simply dedicated — team to help with the project. Be sure to figure out how many volunteers are needed and how you will recruit them. Ask friends, neighbours and family to contribute, or mobilize the community by putting up flyers and going door to door. Social media is also your friend! Make information visible and public by setting up a Facebook event to recruit volunteers. Promoting the event and creating informative and catchy hashtags make it easier to spread awareness. 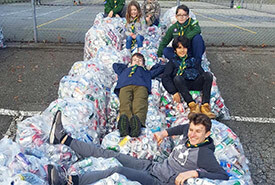 Don’t forget to ask local Scouting groups for help by contacting your area’s council. When the opportunity arises, Scouts are always willing to help. Another crucial detail to consider is transportation. How will volunteers find the event? How accessible is the location, and how will supplies be transported to and from the cleanup? Keeping track of volunteers with a sign-up sheet lets you know how many people to expect, how to contact them and if more support is needed for the project. Lastly, prioritize and build a budget for supplies and other event costs. With a team and a plan in place, the next step is to gather the appropriate supplies. Ask for donations from residents and businesses in your community. People often like being part of something bigger than themselves, even if their contribution is simply donating supplies. Depending on the project, standard supplies can include trash bags, shovels, gloves, labels and printed volunteer information. Ask volunteers to bring supplies from home if you have little or no budget. 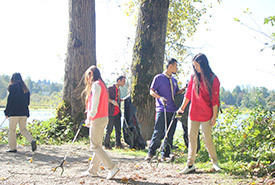 Before starting, it may be wise to separate volunteers into different groups with assigned tasks. This will not only allow for more efficient work, but also less confusion. Prepare a written summary of the tasks and required supplies, along with a schedule of shifts if the event runs for half a day or longer. After a long day’s work, your volunteers will likely be exhausted. Don’t forget to thank them. Without them, the project wouldn’t have happened! Showing the volunteers that you treasure their selflessness might encourage them to attend your next event. You can throw a little celebration party or give out snacks — it’s up to you! After hosting your community cleanup, don’t forget to reflect on your successes and challenges in classic Scouting “Plan-Do-Review” style. This will ensure that your next project results in even greater success. By giving back and caring for their environment together, people gain the satisfaction of being part of something bigger than themselves. So, what are you waiting for? Join in and make an impact on your community. "Heard it from a Scout" is written by members of Scouts Canada's Youth Spokesperson program. This post was authored by Ethan Iverson.